Monsoon season is probably the best and most exciting time to venture out of Pune. Waterfalls, lush green landscapes, and glistening forts offer plenty of options to choose from. Here are 5 places to visit near Pune, in the monsoon season. There are several scenic vantage points in and around Lonavala, but we hear Lion’s Point is one of the best – especially during the monsoons. Located just under 2-hours (approx. 77km) away from Pune by road, make your way here for some ah-mazing panoramic views of the surrounding valley – and if you can, stay until the sun sets. There are a couple of small food stalls nearby serving piping hot chai and corn pakodas, which you can munch on immediately, or take back with you on the journey home. 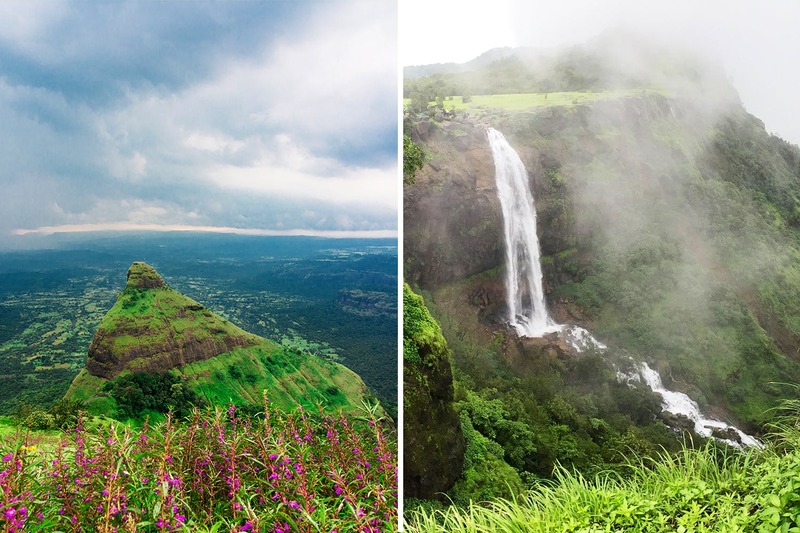 #LBBTip: Check out our 12-hour itinerary to Lonavala, here. Lohagad Fort (aka ‘Lohgad Fort’) is located right near Malavali village (on the outskirts of Lonavala), which you can reach either by local train, or by car – it’s just under a 2hr (around 65km) drive from Pune. The fort is accessible by steps and is most popular for trekking because of the steep incline. Some of the structures like the walls and ramparts are still intact, which make it a popular tourist attraction, and great for taking photos. We think it’d make for a great monsoon-destination trek with your squad (more on that here). There are food stalls and snacks available at the foot of the fort, but beware of wild monkeys! The Bekare Waterfall is located near Bekare village on Bhivpuri Road, somewhere between Karjat and Matheran – just a 2.5-hour’s drive from Pune. Explore the lush surroundings, splash about at the waterfall, or partake in rappelling down its slippery rock face. There are professional expert services that conduct the latter, and you can find out more about them here. We recommend you carry your own snacks and drinking water, as well as a spare set of clothes for after you’re done frolicking in the water. Morachi Chincholi is a 25-acre ‘peacock village’, located just around 2-hours (56km) away from Pune. Now a ‘registered tourism spot under Agricultural Tourism Development Corporation’, this beautiful agri-tourism spot is ideal for picnics and day-trips. There are said to be around 2,500 peafowls here that are attracted by the tamarind trees which grow in and around the village. Recreational activities, guided tours, a resort-stay, and food-packages are available as well – which you can peruse via their website. Located just a 2.5-hour drive (65km) south-west of Pune, Madhe Ghat is most popular for its waterfalls and trekking routes. At a height of approximately 850 meters above sea level, it is situated in dense forests behind the Torna Fort. Madhe Ghat is ideal for a one-day monsoon road trip, and there are trekking and camping packages hosted by local tour operators as well. We recommend you make all the arrangements beforehand, to avoid disappointment. When venturing out of Pune in the monsoon, don’t miss out on the stunning Malshej Ghat, Sinhagad Fort, and our guide to scenic waterfalls around Pune here.